To understand the angle of approach in food photography, think about how a tripod works. The up and down tilt of a tripod head loosely translates to the up and down motion of your neck. Couple this with a little lean in over your subject, and you have your angle of approach over your food. Your eye, camera, and body tilt up and down as you shoot different angles of your food. Although perhaps a bit surprising, the angle of approach in a food image is directly related to the perceived yumminess of that image. The human brain responds most positively to seeing food approached from just up and over the subject. Why is that? Most likely, it has to do with our actual angle of view when we sit down at a table to eat. No bad angles exist in food photography, but you quickly find that some angles look far more appetizing than others. This varies from food to food, so trying multiple angles for a shot is always a good idea. You can see some angles of approach depicted in the following figure. In order to create delicious images for your portfolio, you need to understand the angle of approach by listening to your gut. Often, your eyes and your stomach can tell you whether an angle is appetizing. If the angle of the food image doesn’t draw you in and have you begging for a bite, try a different one. Different angles of approach affect the yum factor. 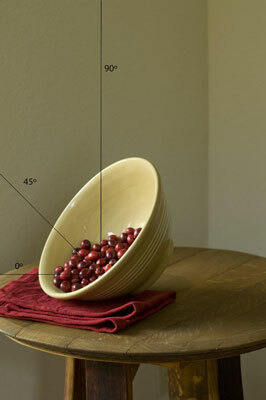 To understand how angles impact your photos, set up a food subject on a table and experiment with shooting various up-and-over angles in the midrange. Go ahead: Play with your food! Try some shots from overhead as well. View the images as you go by using the LCD monitor on your camera. Note how some angles look strikingly different and much better than others. You can get a better playback view by hooking your camera up to a larger screen. Connect your camera’s AV cable to a television set or computer monitor. When you press playback on your camera, it shows the images on the TV monitor, rather than on your camera. Viewing images on a monitor as you shoot can be much clearer than simply looking at the camera’s LCD. Trust your gut instincts when viewing your images. If a particular angle looks really outstanding to you, you’ve probably got a successful photograph for your portfolio.